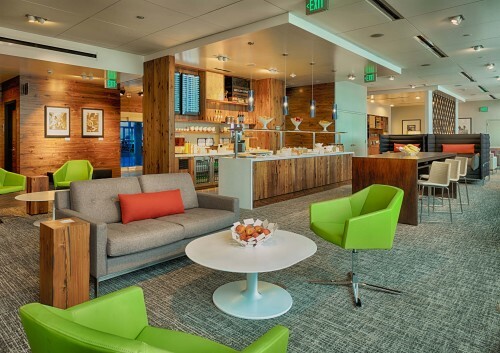 American Express opens its newest Centurion lounge today at Seattle-Tacoma International Airport. Called The Centurion Studio because its smaller (“cozier” in real-estate parlance) than Centurion lounges already operating in LAS, SFO, DFW, LGA, and MIA, this lounge is on Concourse B (by Gate B3) and includes a great view of the airfield and beyond as well as comfortable seating, charging stations, free high-speed Wi-Fi, and a menu of locally-sourced food and beverage items from places such as Macrina Bakery, Theo chocolate, Jones Soda,the Georgetown Brewing Company and Caffe Vita. Those other lounges include The Club – two all-access spaces on Concourse A and in the South Satellite – that you can get into on a day pass for $35.